Hawaii Beaches: West Shore Oahu. West Shore Oahu Beaches: Best in the World! I freely admit that I’m biased about Hawaii beaches… and the beaches of west shore Oahu are the best I’ve yet found anywhere! I haven’t been to every beach in the world, but I’ve been to beaches on both the west and east coast of the Continental United States, the Mediterranean Sea, Indonesia, Australia, and other Pacific Ocean islands. So far, none of them quite compare to Hawaiian beaches. 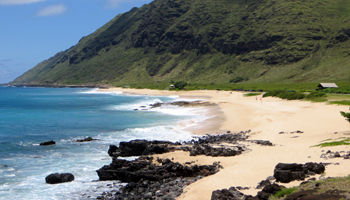 And of all the world-class Oahu beaches, many along the Waianae Coast (west shore) have been my favorites ever since I was 11 years old and living on the beachfront at Makaha Surfside apartments. It’s not just the fact that west shore Oahu beaches have endless stretches of clean white sand – often with hardly a soul in sight. Nor is it just the crystal clear waters, which seem to reflect every conceivable shade of blue. It’s not just the fact that every segment of this coastline offers some of the best snorkeling in Hawaii (which is why commercial snorkeling tours take groups out everywhere from Kahe Point to Yokohama). Nor is it the fact that when the waves get too rough to snorkel, it probably means you’re in for some of the nicest surf in Hawaii. Almost the entire coastline is ideal for shore fishing in Hawaii – year round. Then, during the months of January through April, it’s practically guaranteed that you’ll see migrating humpback whales from anywhere on the Oahu west shore. Furthermore, this is a great area for dolphin watching. Throughout the years, I’ve had multiple dolphin sightings at Yokohama Beach and near the Kahe Point power plant. 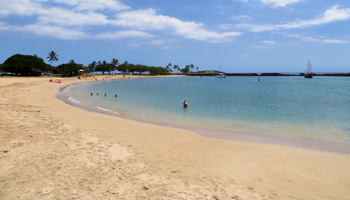 If you’re staying at the Disney Aulani Hotel or in the Ko Olina Resort area, these are the closest and easiest beaches for you to enjoy. However, if you’re staying in Waikiki or elsewhere on Oahu, you’ll have a drive of maybe one hour or more to get to the west shore Oahu beaches – but I think they’re worth it. Hidden between Ko Olina Lagoon 1 and the Paradise Cove Luau, at 92-1101 Alii Nui Drive in the Ko Olina Resort area of Kapolei, is a popular public beach called Lanikuhonua (Where Heaven Meets the Earth). Yeah, the name is a little pretentious. 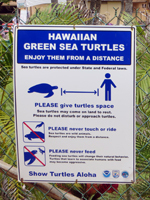 But if you want to scratch “Hawaii snorkeling with green sea turtles” off your bucket list, this place is your best bet. Lanikuhonua Beach is a nice little sheltered cove, which makes it ideal for snorkeling almost year round. And you can usually see multiple turtles swimming throughout the cove as soon as you step onto the sand (the brown spot in the water on the left edge of this photo is a green sea turtle). Just make sure you look but don’t touch. It’s illegal to harass this endangered species in any way. Although it gets a little bit more crowded on the weekends, this photo shows the typical crowd on a beautiful summer afternoon at Maili Beach. Enough said. But just in case you need more, this is a great place for the kids to play in the sand and/or shore break. The snorkeling is very nice; and sometimes there is a fun wave that breaks right out by the tip of the jetty. When I first moved to Hawaii, this beach was absolutely covered in puka shells. I think a lot of them have since been turned into necklaces for tourists, but just look around and I’m sure you’ll find some. 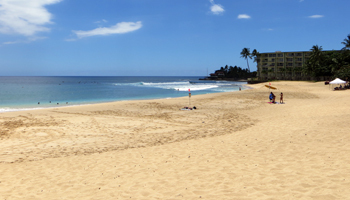 The section of beach in this photo is located across the street from 87-064 Farrington Highway in the Maili area of Waianae, HI. 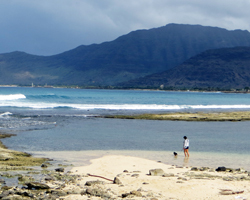 This popular beach park is one of the few on Oahu’s west shore that you can’t see directly from Farrington Highway. You’ll have to turn onto Pokai Bay Street or Bayview Street in the middle of Waianae Town. Then once you arrive, you’ll find the best of all worlds. 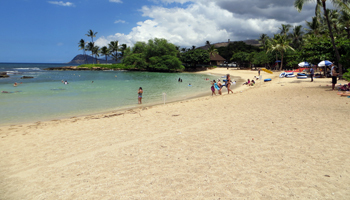 Half of the bay is well sheltered and ideal for snorkeling almost year round. The other half is open to oceanic wave action, which brings some fantastic surf – usually in the winter and spring. There’s plenty of sand for beach play. And unlike many other west side beaches, there’s easy access to shade in the adjacent beach park. 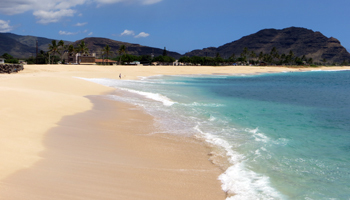 World famous for its legendary surf break, Makaha Beach is usually the most crowded of all west shore Oahu beaches. But I’ve never seen it even half as crowded as Waikiki Beach. This is another great place to let the kids play in the sand and shore break. The waves break (primarily) to the right side of the beach in front of the apartment building. That area is also very shallow and rocky, so be careful if you want to swim or play in the water there. Unfortunately, the best snorkeling at this beach is right where the waves break, so I’d probably go elsewhere if you’re primarily hoping to look at fish. Last but certainly not the least… at the very end of Farrington Highway, right before you reach Kaena Point, you’ll end up at Yokohama Beach Park. 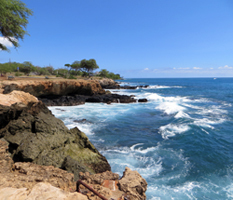 To me, this is one of the most beautiful locations on Oahu (see photo at the top of this page). It’s one of my favorite beaches to go for a swim. 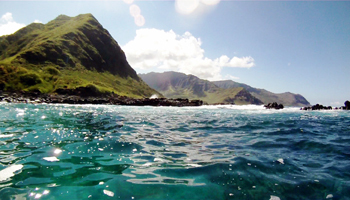 It’s a gorgeous Hawaii snorkeling spot; and the surf isn’t bad either. Just make sure you’re not trying to snorkel while waves are pounding into the rocks. Although I’ve never seen it completely deserted, this beach feels secluded – like a secret spot at the end of the world. In general, winter and spring are the seasons for surfing on the Oahu west shore, and summer tends to be the best time for snorkeling. However, as you can see in many of these photos (most of which were taken in mid-August), there can be wave action year round. Fortunately for you, the surf is usually less powerful than what you’ll encounter on the north shore in winter and/or on a daily basis at Sandy Beach. Nevertheless, you will still need to exercise good judgment about your water play. Disclaimer: No matter how I describe these beaches, stupidity and carelessness can still kill you. Use your brain and take responsibility for your own safety. Know the limits of your ability and stay within them. Watch your kids like a hawk. If you’re swimming and/or snorkeling near waves and/or rocks, pay attention to your surroundings and stay alert for hazards. Never turn your back to the waves. Use your sunscreen. Heed posted warning signs. Be smart about how you enjoy your Hawaii vacation.